What It’s About: David MacLean (Jimmy Hunt) sees an alien spacecraft crash in a nearby sandpit. David’s father George (Leif Erickson) returns from investigating changed, and soon every adult David turns to for help either refuses to believe him, or is similarly afflicted. Can David convince someone to help him before it’s too late? Why Watch it Today? : Today is National Children’s Mental Health Awareness Day, and what better time to watch a film that depicts childhood fears made real? 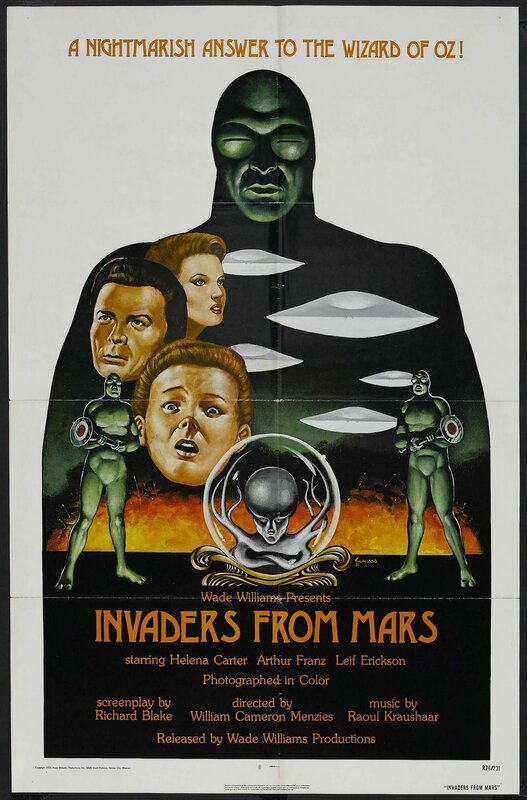 Invaders from Mars is solid nightmare fuel, based around some of the most basic of kids fears-that no one will believe you when you tell them something terrible that’s happening, and that adults will change and stop loving you. Just a clip of George’s transformation stuck in my kid memory for years, making me nervous when my father was out working in the yard until late. Invaders from Mars‘s nightmare quality is only enhanced by the garish color, costumes, and the ending, which leaves poor David right where he started. This entry was posted in Aliens, Body Snatchers, Horror, Independent, Monster, Movie of the Day, Nightmares, Sci-Fi, The Original and tagged 20th Century Fox, back to the top, Barbara Billingsley, boy who cried wolf, Drive-In, it's not over, it's only a dream, Leif Erickson, Morris Ankrum, scientists, traumatized children, William Cameron Menzies.